Roatan Real Estate, island properties, Caribbean destinations, mainland properties, buyer's agent, agents, agencies, buying homes and property, construction, Caribbean land, homes, businesses. Home sites, lots, realtors, brokers, mls listing agents. On a hillside adjacent to Carambola Botanical Gardens, eight homesite's are available each with a breath taking Caribbean view of the Anthony Key area of Sandy Bay. All homesite's have Carambola Garden privileges, paved access and underground utilities. The beaches of West Bay, the shopping of West End and the International Airport are all within twenty minutes of the idea location. Haven't heard of our island before? Well that's the beauty of it. Its an island with stunning beaches and pristine reefs, fantastic properties and a sense of peace and tranquility you just won't find in many other Caribbean destinations. On a hillside overlooking the beautiful Lawson Rock area, six lots are available each with a panoramic ocean view. Conveniently located between the International Airport and the beaches of West Bay. I AM A BUYER'S AGENT My job is to help my clients see ALL of the options available from ALL the Roatan Real Estate agents and agencies so that you can make the most informed decision possible when buying Roatan Real Estate homes and property. I have been in sales throughout my life all over the world. 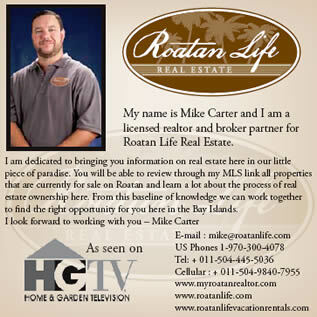 My knowledge of Roatan real estate, construction, and island ways, make me an invaluable resource when buying Roatan Real Estate, Caribbean land, homes, or businesses. This can also be said of Roatan Real Estate. “Real estate cannot be lost or stolen, nor can it be carried away.